The Comet-probing Rosetta spacecraft will reach Comet 67P/Churyumov-Gerasimenko in 2014, after a total of three Earth swing-bys and one Mars swing-by. A spacecraft that'sbeen chasing a comet for six years should drop its lander on the iceball's southern half when it finally catches up, a new studysuggests. 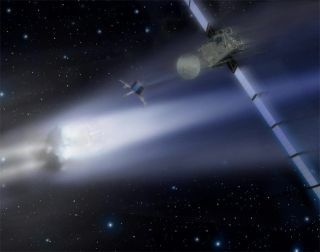 The European SpaceAgency's Rosettaspacecraft has been zooming toward Comet67P/Churyumov-Gerasimenko since it launched in 2004. It should reachthe comet in 2014 and drop a lander named Philae on the surface totake an up-close look. "Southern sitesappear to be both the safest and the most scientificallyinteresting," study co-author Jeremie Lasue of Los AlamosNational Laboratory said in a statement. Rosetta and Philaeare expected to monitor Churyumov-Gerasimenko's evolution over thecourse of 13 months as the comet approaches the sun, then careens outinto deep space again. The comet is about 2.4 miles (4 kilometers)across and completes one orbit around the sun every 6.6 years. The heartof a comet is a porous mixture of dust, waterice and other frozen substances like carbon dioxide and carbonmonoxide. As a comet approaches the sun and its nucleus starts toheat up, many of these materials vaporize, forming the comet'scoma — a diffuse cloud of dust and gas aroundthe nucleus — and tail. Lasue and hiscolleagues developed 3-D computer models that predict the activity ofChuryumov-Gerasimenko's nucleus — how heat transfers through it,for example, and how its various ices vaporize. The study coveredthe period of Rosetta's initial encounter with the comet in 2014,which should take place just inside the orbit of Jupiter, about 373million miles (600 million km) from the sun. It ran through thecomet's closest approach to the sun in August 2015. The models show thatthe comet's southern hemisphere should be the most stable and safestplace for Philae to land, researchers said. DuringChuryumov-Gerasimenko's approach to the sun, solar heat will boil offhuge amounts of the comet's dust, water ice, frozen carbon dioxideand other core materials. The bulk of thisdramatic venting should occur in the comet's northern half whenPhilae touches down in November 2014, the researchers said. The models predictthat Churyumov-Gerasimenko's northern face will be emitting up to 66pounds (30 kilograms) of gas and 110 pounds (50 kg) of dust everysecond — conditions that don't make for a calm, easy landing. So the comet'ssouthern hemisphere is a safer landing bet, researchers said. And,there's a bonus. "In addition,due to the orientation of the comet, thesouthern hemisphere will be protected from extreme temperaturevariations at the time of delivery," Lasue said. The southernhemisphere of comet Churyumov-Gerasimenko is also a better target forscientific reasons, the researchers said. The team's computersimulations suggest that the comet's southern region is significantlymore eroded than the north. That's because thecomet's south pole has been cooked more by the sun over the years.Churyumov-Gerasimenko's south pole faces the sun pretty much head-onwhen it makes its closest approaches, researchers said. The southern face ofChuryumov-Gerasimenko should therefore give Philae easier access tomaterial just below the comet's surface, researchers said. Thelander will be able to drill down up to 12 inches (30 centimeters) tocollect samples of cometary dirt for on-board analysis. "Philae willnot have to drill down far to find those pristine samples,"Lasue said. Philae will bepowered by solar cells, so the more intense solar energy on the southside during the comet's approach should also help keep the landercharged up and running, the scientists said. "From ourpresent results, we've concluded that the southern hemispherepromises the best landing sites," said study co-researcher MariaCristina De Sanctis of the Istituto Nazionale di Astrofisica'sIstituto di Astrofisica Spaziale e Fisica Cosmica in Rome, Italy. "Asmore data on Churyumov-Gerasimenko becomes available to betterquantify our results, we will be able to add to the picture and helpprepare for a safe landing for Philae." The team presentedits findings at the European Planetary Science Congress in Rome onSept. 23.